BACKGROUND: A smartphone microscope adapter is an alternative to a permanently mounted camera, which often requires a specially designed light path as well as a computer system for data storage and network connectivity. A common disadvantage of these adapters is that they need to be repeatedly mounted and dismounted; this is inconvenient during serial observations. PURPOSE: The study purpose is to develop and test a semi-permanent microscope adapter. METHODS: Our prototype was designed using three-dimensional (3D) computer-aided design software and was 3D printed for testing. Two tests were designed to quantify the workflow improvement by measuring the time required to complete specific movements, which simulated the actions of capturing photographs by using an adapter and a slit-lamp biomicroscope. Our prototype was the experimental adapter, and two commercially available products were used as references. A single-shot test measured the average time required to complete a photographing cycle, in which a single photograph was recorded. A multiple-shot test measured the time required to complete cycles in which a different number of photographs were captured; thus, the time required specifically for the preparation phase of photographing was determined. Both tests were performed by 4 researchers. RESULTS: The average time required to complete a cycle using our prototype in single-shot test was significantly shorter than that using one of the references. For the other reference, significances were shown in 2 testers' results. In the multiple-shot test, the linear regression analysis also showed that the preparation phase of our prototype was significantly shorter than the preparation phase of the two commercially available products (P < 0.001). CONCLUSIONS: The semi-permanent design may improve the workflow of photography using smartphone adapters, thereby reducing the time and effort required for preparing devices, particularly when making multiple consecutive observations or when the targets disappear fast. For ophthalmologists today, anterior- segment images are widely used for documentation, the follow-up of changes, teleconsultation, and medical education during daily practice. Conventionally, images are captured using a specialized slit-lamp biomicroscope with a permanently mounted digital camera, which is connected to a computer for data transfer and storage. In recent years, smartphone-based medical imaging systems have aroused widespread interest not only due to the low cost and universality of the smartphones, but also due to their built-in connectivity, storage, and many types of supportive functionalities with applications for image processing and editing.,,,,,, In terms of photomicrography, smartphone adapters have proven to be inexpensive and easily accessible alternatives and provide comparable image quality with slit-lamp biomicroscopes and other microscopes.,, Due to advancements in technology, the image quality of photographs and videos captured using smartphone camera modules has improved considerably in the past decade. Some models already provide 4K (3840 × 2160 or 4096 × 2160 pixels) video recording and high frame rate or slow-motion video recording. 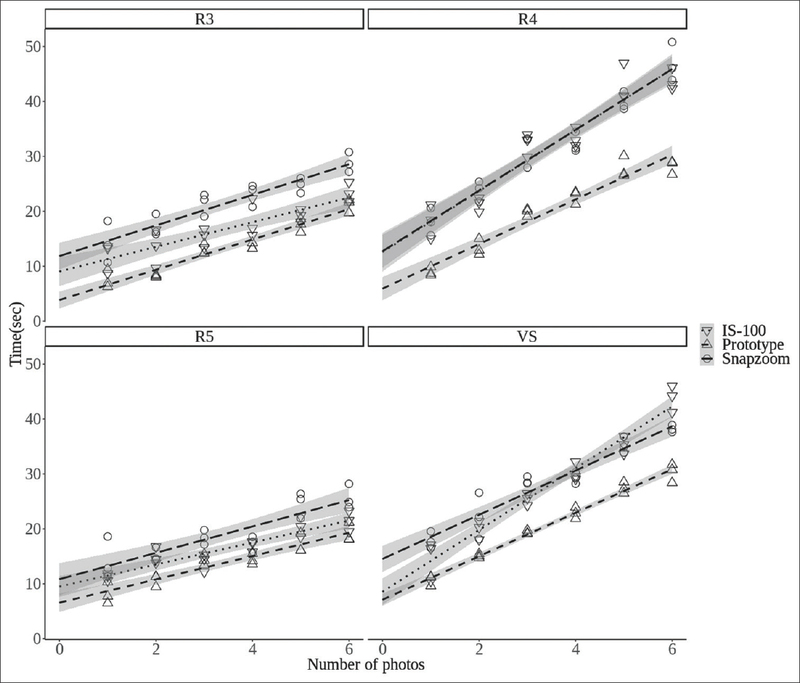 The rapid evolution of smartphone technology has facilitated considerably faster improvement in the performance of smartphone-based systems than that of the conventional anterior-segment camera in certain aspects such as video frame rate because the replacement rate of conventional anterior-segment camera is relatively low. However, a major shortcoming of smartphone adapters has been noted when they have been used on a device without an additional eyepiece (e.g., a teaching scope); the user has to repeatedly mount and dismount the adapter to continue working because the eyepiece being occupied by the adapter prevents direct observation by the user (human eye). Moreover, for each time the user mounts the adapter, there is a need of fine adjustments of the device to ensure good alignment and stability of the device before one can start capturing photograph or video. Although some adapters can be arranged faster than others because of their fast-release mechanism, such as Magnifi (Arcturus Labs, Lawrence, Kansas, USA, an iPhone-specific adapter) and Carson HookUpz IS-100 (Carson Optical, Ronkonkoma, NY, USA, a universal adapter), this inconvenience would still be quite noticeable when a series of consecutive observations and documentations (e.g., in a clinic with tens of patients or a laboratory with dozens of microscopic slides to work with) are being conducted, compared to a conventional integrated camera system. The objective of this work was to minimize the interruption of the photographing workflow by using a newly designed semi-permanent adapter. We constructed a prototype and compared it with two commercially available products in terms of preparation time and effort required in the photographing workflow. We developed a semi-permanent, universal smartphone-eyepiece adapter for slit-lamp biomicroscopes and other microscopes. The adapter has three major components, namely an adapter ring for the eyepiece, an adjustable phone holder, and a shuttle mechanism to move the phone holder. Our goal was to create a mechanism with which one could move the phone back and forth; thus, when the user finishes capturing an image, the phone can be moved away from the eyepiece easily without having to dismount the entire adapter. The dimensions of smartphones were obtained from the website Phone Arena (https://www.phonearena.com/) to determine the required size range of the phone holder. The adapter was designed using three-dimensional (3D) computer-aided design software Onshape (Onshape, Cambridge, MA, USA) and Creo Parametric 3.0 (PTC, Needham, MA, USA) and was 3D-printed for further evaluation. Two types of mechanism were evaluated, namely a hinge and a rail. When the hinge was used, the smartphone could be flipped away from the eyepiece when not in use. As shown in [Figure 1], the center of gravity moved far away from the adapter ring, thus producing excessive torque, causing the entire structure to spin and bend. The rail design has considerably higher stability than the hinge design [Figure 1] and was then tested in a workflow test. Figure 1: The hinge and rail design. (a and b) In the hinge design, spontaneous clockwise rotation of the whole adaptors occurred after the phone is flipped away from the eyepiece. (c and d) The rail design showed higher stability than the hinge design. In addition to the shuttle mechanism to move the phone, we also added a mechanism to adjust the distance between the phone and eyepiece, as well as a compensating mechanism against a minor tilt of the phone resulting from the presence of fine gaps between the parts and the flexibility of parts, which was inevitable because of the presence of the parts [Figure 2]. Figure 2: Photo and and schematic representation of semi-permanent adapter prototype. (A-D) the adapter ring, the phone holder (phone shuttle), the mechanism for distance adjustment between the phone and the eyepiece, and compensatory mechanism against minor tilt of the adapter. (E) The phone holder can be adjusted to allow usage of certain smartphones with camera modules on the edges (not on the midlines). Photographs of the same investigator's eye were captured using the same smartphone (ASUS PadFone 2 [ASUSTeK Computer, Taipei, Taiwan]) with each adapter. All the three adapters produced images of similar quality [Figure 3], thus suggesting that the alignment of the smartphone's camera with the eyepiece was similar for all the three adapters. Figure 3: Image quality comparison. The photographs taken with (a) prototype, (b) Carson HookUpz IS.100, and (c) Snapzoom adapters showed similar quality. We selected the Snapzoom (Hi Resolution Enterprises, Honolulu, HI, USA) and Carson HookUpz IS-100 (Carson Optical, Ronkonkoma, NY, USA) (from now on referred to as IS-100) adapters, both universal adapters, as the reference adapters for the test. The former resembles a conventional, screw-fastened adapter, whereas the latter is an adapter with special fast-release design. 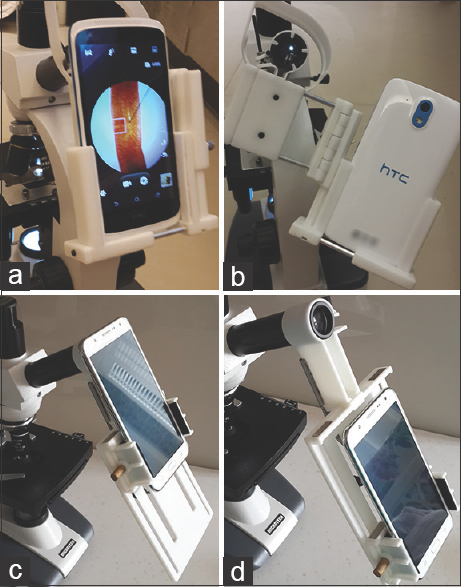 A Haag-Streit BI 900 slit-lamp biomicroscope (Haag-Streit AG, Köniz, Switzerland) and a Samsung Galaxy J7 (Samsung Electronics, Seoul, South Korea) were used in the tests. For the two commercially available adapters, sponge spacers were inserted between the smartphone holder and phone to prevent the buttons from being inadvertently pressed when the holder was tightened against the edge of the phone. A 3D-printed target with multiple columns of different heights was mounted on the forehead rest of the slit lamp as targets at different distances [Figure 4]. The tests were conducted by a third-year resident (R3), a fourth-year resident (R4), a fifth-year resident (R5) and a visiting staff (VS) member in the ophthalmology department of Chang Gung Memorial Hospital. Before the experiments, the testers first spent 5 mins in familiarizing themselves with the three adapters, smartphone, and slit-lamp system. A Bluetooth remote shutter control was connected to the smartphone to prevent errors caused by the smartphone's touchscreen. Before the test of a specific adapter, the adapter was mounted and a few test shots were recorded to confirm the correct configuration of the adapter. Each reference adapter (Snapzoom or IS-100) was removed without detaching the smartphone, forming an adapter–smartphone unit. The smartphone holder was slid down to a resting position with the experimental (prototype) adapter. The Bluetooth remote shutter control was placed on the table, on the left side adjacent to the slit lamp. The slit lamp's focus was set at an initial position using the joystick. The initial position was the position closest to the tester (farthest from the target). While using the reference adapters, the adapter–smartphone unit was placed on the table, adjacent to the slit lamp on the right side. While using the prototype adapter, the smartphone holder was in its resting position [Figure 5]. The investigator started a timer and simultaneously conveyed a start signal to the tester. The tester used the joystick to bring column number 1 into focus. The tester then attached the adapter (in the case of reference adapters) or slid the smartphone upward (in the case of the prototype adapter). The tester confirmed that the target was in focus and pressed the remote shutter control to capture a photograph. If the object was not in focus, autofocus was manually activated by touching the screen before capturing the image. The tester removed the adapter–smartphone unit (reference adapters) or slid the smartphone holder downward back to its resting position (prototype adapter). The timer was stopped as soon as this movement was completed. Steps 1–4 were repeated 15 times. Before the test, the adapter–smartphone unit, slit lamp, dummy, and remote control were prepared as described in the single-shot test. The slit lamp's focus was set at column number 1 using the joystick. While using the reference adapters, the adapter–smartphone unit was placed on the table, adjacent to the slit lamp on the right side. While using the prototype adapter, the smartphone holder was in its resting position. When the timer was started by the investigator, the tester first attached the adapter to the eyepiece (reference adapters) or slid the smartphone upward to the photographing position (prototype adapter). The tester then moved the joystick to focus on column number 2 using the screen of the smartphone. A photograph was captured. During the first to the third cycles, the tester proceeded to step 4. From the fourth to the sixth cycles, the tester used the screen to focus on column number 3 and capture another photograph before proceeding to step 4. During cycle numbers 3n+1, 3n+2, and 3n+3, the tester captured photographs of column number 3 to column number “n+2” (i.e., n+1 photographs in each cycle) before proceeding to step 4. The tester removed the adapter–smartphone unit (reference adapters) or slid the smartphone holder back downward to the resting position (prototype adapter). The timer was stopped as soon as this movement was completed. Steps 1–4 were repeated 18 times (n = 2–5). The number of photographs captured in each cycle was increased after every three cycles, from one photograph to six photographs. To simulate real-life settings, if the adapter tilted during refocusing (step 3), the tester would adjust the device as fast as possible and continue without pausing the timer instead of stopping the timer and repeating the cycle. Microsoft Excel 2016 and R version 3.2.5 (Microsoft, Redmond, WA, USA) were used for statistical analysis. A mixed-effect model was created using the lme4 package. For the single-shot test, the Kruskal–Wallis test with post hoc Dunn's tests was used to determine the significance of the difference between the three adapters. For the multiple-shot test, each tester's result was subjected to simple linear regression. Then, general linear mixed-effect models with random intercepts and slopes for testers were used to partial out the variance due to tester differences. The correlations between the time consumed and number of repeated cycles when the reference and prototype adapters were used were measured, and the difference in slopes corresponding to the reference and prototype adapters was tested using the likelihood ratio test. For every testers, the average time required to complete a single photographing cycle using prototype was the lowest among models. When performed by the R3, R4, R5 and the VS, the results were 10.34, 9.87, 10.15 and 12.33 seconds with the prototype, 13.22, 12.49. 10.95 and 14.32 seconds with IS-100, and 17.28, 23.18, 14.21 and 17.48 seconds with Snapzoom, respectively. We utilized Kuskal-Wallis test followed by Dunn's test to see whether there were any significant difference between the models. The results showed that the prototype performed significantly better than IS-100 when tested by the R3 (P = 0.0062) and the R4 (P = 0.0031). 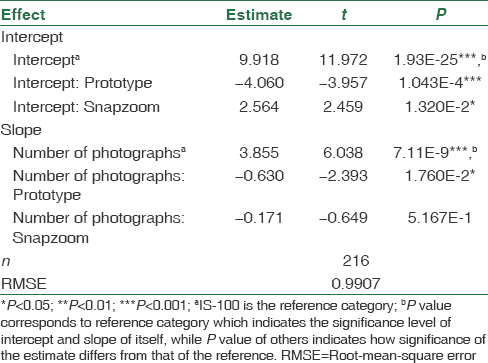 The prototype performed significantly better than Snapzoom (P < 0.0001, all testers) [Table 1]. Considering that the action of capturing the photograph with an adapter consists of two phases, namely the preparation and capture phases, we hypothesized that the time difference corresponding to the reference and prototype adapters resulted from the preparation phase, which involves mounting and dismounting the adapter for the reference adapters. We attempted to isolate this phase from a natural work cycle. Moreover, in real life, clearly demarcating the preparation and capture phases is difficult. Thus, we did not define and measure the preparation phase. Instead, we used the intercept of a regression formula, which exclusively represents the time required for the preparation phase. [Figure 6] depicts the results of simple linear regression. The intercept of the prototype was the smallest in the results of all the testers. [Table 2] lists the results of the linear mixed-effect models. The intercepts at the y-axis of time were 12.483, 9.918, and 5.858, for Snapzoom, IS-100, and our prototype respectively; the intercept of the prototype was significantly smaller than the intercepts of both reference types (P < 0.001). Notably, we also found that the slope corresponding to the prototype adapter was significantly gentler (P = 1.76 × 10−2, t = -2.393) than those corresponding to the IS-100 and Snapzoom adapters, thus indicating that a shorter time was needed to capture a photograph using the prototype adapter than the IS-100 or Snapzoom adapter. Figure 6: Relationships between spent time and number of photos per cycle, of three adapters, by simple linear regression. Gray areas indicate 95% confidence interval of regression lines. The prototype had the lowest intercepts when operated by all four testers, implying the least preparation time (3.85 ± 1.44, 5.92 ± 1.97, 7.57 ± 1.55 and 7.10 ± 1.02 seconds, compared to IS-100 with intercepts of 9.05 ± 2.46, 12.57 ± 3.26, 9.51 ± 1.76 and 8.57 ± 2.24 seconds, and Snapzoom with intercepts of 11.85 ± 2.23, 12.73 ± 2.78, 10.83 ± 2.70 and 14.52 ± 2.22 seconds, when operated by the R3, R4, R5 and the VS respectively). We have demonstrated a new semi-permanent adapter and its potential to accelerate the workflow of capturing photographs and reduce the effort of repeated fine adjustments of an adapter, by using a slit-lamp microscope. The single-shot test showed that our prototype adapter required a significantly shorter time for completing the photographing cycle than that of the reference adapters. Up to one-half of the time is saved when a conventional screw-fastened adapter is replaced by our semi-permanent adapter, and up to one-fifth of the time is saved when a fast-releasing adapter is replaced by a semi-permanent adapter (depending on the operator). The multiple-shot test revealed that the time differences between adapters could be attributed to the preparation phase of the photographing cycle. We believed that the semi-permanent design with a phone shuttle played a major role in the time improvement. Furthermore, because the distance between the phone and the eyepiece is adjustable and can be fixed as desired with our prototype, it also eliminates the need with a conventional adapter to adjust the distance every time the user mounts an adapter. The slope corresponding to the reference adapters in the regression model from the multiple-shots test is steeper than the slopes corresponding to the prototype. This may be partially because of the unsteadiness observed during the experiment and was accounted for by our arrangement to overcome device tilting during the experiment. A possible cause of this unsteadiness, which costs extra effort to adjust the device, is the design of the eyepiece holder. Although the Snapzoom adapter was designed for binocular devices, a slight mismatch of the angle between the two eyepieces and two holders was observed. The IS-100 adapter had an elastic eyepiece clamp with soft linings which made it more “tolerant” to misalignment. We thought it might have caused tilting of the adapter to occur more often. A semi-permanent smartphone adapter allows a doctor to switch from his own eyes to a smartphone effortlessly in a few seconds. It is more challenging to exam the patient's eye by watching a smartphone's screen. It may be caused by the loss of dynamic range, depth of field, and stereopsis. Moreover, a patient's eye cannot stay at the same position for too long and repeating certain exams under a slit-lamp such as a Seidel test or a tear breakup time test will possibly generate different results and may cause more discomfort. Due to the reasons above, it is more practical to exam a patient with human eyes and then switch fast to a smartphone for documentation than to fix a smartphone on an eyepiece throughout the exam, or to mount and dismount an adapter repeatedly. The devices used in our study are relatively different visually; hence, blinding the testers was not possible. The workflow tests were subject to bias due to human factors, such as personal preference and habit, as well as the learning effect. The tests were performed in a controlled environment with simplified movements. The difference of labor cost and consistency between the prototype and the reference adapters could not be fully reflected by the time cost, but the time cost may be a more objective measure. The number of testers is small (only four), and the testers have similar background (ophthalmologists), so they could not represent the population of all microscope users. Further test with more testers may better average the human factors. In addition, further tests in actual clinical and laboratory settings should reveal the true effectiveness of the design. Other factors that influence the feasibility and convenience of an adapter also need to be considered; for example, portability, when moving to different spaces and switching devices. Our prototype was designed for repeated use to meet our needs in daily practice (in an ophthalmologist's office or a pathology laboratory). It may not have the same performance in other settings. Further studies are needed to provide real-life data from the clinical applications of the device. Smartphone adapters not only provide a low-cost alternative to anterior-segment cameras, but also have the potential to use cutting-edge mobile technology for performing tasks that cannot be completed using the conventional digital imaging systems. A semi-permanent adapter design may further improve the smartphone-based system by making it more integrative and instantaneous, especially for routine, repeated uses and for exams that have short observation windows. We thank Vincent Ho, who is the manager of the engineering department of Majestic Technology Corporation, Taipei, Taiwan, for the technical support provided in the development of the prototype. Dr. Jen-Hsiang Shen, Dr. Hung-Da Chou, Dr. Yuan-Yao Fan, and Dr. Yen-Chang Chu were the testers in the workflow tests. This manuscript was edited by Wallace Academic Editing. Chieh-Hung Yen owns the patent of the semi-permanent adapter design. Chun-Hsiu Liu and Chieh-Hung Yen are colleagues. Other authors have no conflicts of interest to disclose. Bellina LE. Missoni, mobile cell-phones (M-phones) in telemicroscopy: Increasing connectivity of isolated laboratories. Diagn Pathol 2009;4:19. Tuijn CJ, Hoefman BJ, van Beijma H, Oskam L, Chevrollier N. Data and image transfer using mobile phones to strengthen microscopy-based diagnostic services in low and middle income country laboratories. PLoS One 2011;6:e28348. Teichman JC, Sher JH, Ahmed II. From iPhone to eyePhone: A technique for photodocumentation. Can J Ophthalmol 2011;46:284-6. Lord RK, Shah VA, San Filippo AN, Krishna R. Novel uses of smartphones in ophthalmology. Ophthalmology 2010;117:1274-000. Chhablani J, Kaja S, Shah VA. Smartphones in ophthalmology. Indian J Ophthalmol 2012;60:127-31. Lin SJ, Yang CM, Yeh PT, Ho TC. Smartphone fundoscopy for retinopathy of prematurity. Taiwan J Ophthalmol 2014;4:82-5. Morrison AO, Gardner JM. Microscopic image photography techniques of the past, present, and future. Arch Pathol Lab Med 2015;139:1558-64. Singaravel S, Aleem MA. Hands-free: A Low-cost adapter for smartphone microscopic photography using a cardboard toilet-paper roll. Arch Pathol Lab Med 2016;140:741-3. Fogazzi GB, Garigali G. The different ways to obtain digital images of urine microscopy findings: Their advantages and limitations. Clin Chim Acta 2017;466:160-1. Potthoff RF, Roy SN. A generalized multivariate analysis of variance model useful especially for growth curve problems. Biometrika 1964;51:313-26.